With the holidays coming around, many people will be getting ready to prepare special foods for friends and family. While there are certainly family favorites that will be prepared time and time again, every table can benefit from a new recipe or two. 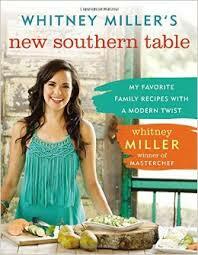 Whitney Miller's New Southern Table features recipes from the Masterchef winner's family as well as inspiration from her world travels. The book as all the usual categories, including Breakfast, Sunday Dinners and "Somethin' Sweet," as well as directions for preparing "Essentials and Enhancers" (such things as ketchup, various types of pesto and peanut butter). There's also a helpful section titled "My Southern Pantry" that includes staple items that everyone should have on hand. The recipes include such favorites as Turkey Potpie, Fried Green Tomatoes and Pork Ribs. Many of the recipes have been tweaked to include lower fat/sugar/calorie options from ones Miller grew up enjoying (such as using olive oil to make biscuits). Most of the recipes include delicious-looking photos of the finished dishes to entice would-be cooks to get busy! There are also a large number of photos of the author's family (some identified by captions -- I just assume the non-captioned photos contain members of her family). If you aren't related to her, I fail to see the appeal of all the photos. Each recipe is introduced with a small explanation of why it's included or how she's updated a recipe (again, lots of "I remember back when my grandma . . ." type asides thrown in that will be of limited appeal to those outside her inner circle). Overall, it's a very nice cookbook, with appealing recipes that don't require a lot of specialized ingredients or equipment (she recommends using a plastic freezer bag with a corner cut off for piping, for instance). Plenty of substitutions are included as well, in case every ingredient isn't to your liking.